Although hard to see but this shop was closed down when this photo was taken. They had shut because that whole block was going to be re-developed. They actually moved to a site on the opposite side of the road, about mid-way from this shop and East Street. Lasted, probably, until mid-'80s at the latest. Comment: Mark Brady. I Used to buy punk albums at the Waterloo branch in 1978/79 - cheaper than HMV, Our Price etc. Comment: Marc Griffiths. (June 29, 2012) Neil Williams said:I worked for Sundown between 1978 and 1982. 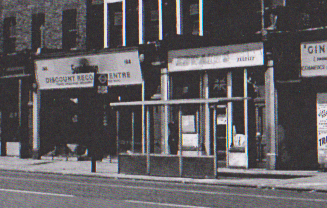 Soon after I left they went over to video rental eventually closing the Walworth Road branch around 1985 . Possibly the Waterloo branch carried on a little longer. (June 17, 2015) After work on Fridays, every week, I'd walk from Camden Town to Waterloo, have an Indian meal on The Strand then head over to Sundown Records,over the bridge to see if anything I wanted, before walking down to Camberwell and a night in the pub. Saturdays I'd sometimes do the same, walk down Walworth Road to Waterloo, get a few LPs, then into the West End. Sundown sold me all my Blondie, Pretenders, Lou Reed and Patty Smith albums. I was surprised at first on how much cheaper than everywhere else. Of course, now, everything seems massively expensive, my wages were £60 a week, an LP £2.50. Sundown were friendly staffed shops, I loved them. Comment:Robert Jones. ( March 18, 2016) Was this the same business who owned the Edmonton Sundown and - I think - Mile End Sundown. I went to see the J Geils Band there in the mid seventies. Comment: Truats Heytarl.